Learn the fundraising formula that all successful non-profits use. From large international charities to small local non-profits, organizations that meet or exceed their fundraising goals each year follow The Non-Profit Fundraising Formula. From finding new prospects to cultivating donors, making asks to upgrading and renewing support, this book will teach you how to apply the formula to your non-profit fundraising efforts. Click here for more information or to get your copy. Do you want to run a silent auction fundraising event, but without the stress or hassle that normally accompany auctions? 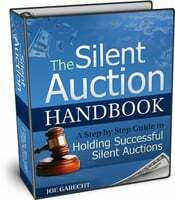 In this book, Joe Garecht walks you step-by-step through the silent auction game-plan he developed while leading five and six figure silent auctions. This guide includes tips and strategies for raising more money, finding better items, selling more tickets, organizing simpler event logistics, and much more. Also comes with sample auction letters, spreadsheets, staffing grids and more. Click here for more information or to get your copy. Non-profit fundraising doesn’t need to be intimidating. 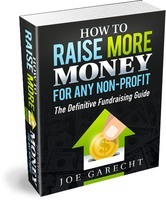 In this book, Fundraising Authority founder Joe Garecht presents the basics of non-profit fundraising in an easy to understand format. Perfect for those new to fundraising, including development staff, board members and fundraising volunteers. This book provides an overview of each important fundraising tactic, including finding prospects, making asks, holding events, sending out fundraising letters (direct mail) and much more. Click here for more information or to get your copy. If you’re looking for a complete, soup-to-nuts guide to raising more money for your organization, this is it. In this 272 page guide, Joe gives both basic strategies and advanced tactics for all aspects of non-profit fundraising, from finding prospects to making asks to holding amazing fundraising events and writing supercharged fundraising letters. 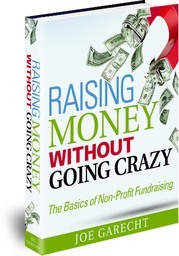 This book is the most complete, detailed guide to raising money available anywhere. Click here for more information or to get your copy. This great book (available in paperback or as an e-book) offers a complete strategy for overcoming your fear and becoming the fundraiser you always wished you could be. Marc provides a formula for making asks that doesn’t “turn off” donors or cause fundraisers to feel bad about asking. Includes Marc’s patented “Get R.E.A.L.” fundraising formula. Click here to see my review of the book. Noted fundraising consultant Pam Grow has pulled together an amazing resource for small, one-person fundraising shops. Simple Development Systems is the guidebook on how to raise money in very small non-profit organizations. In the book, Pam presents strategies that apply specifically to one-person and two-person development offices, and offers step-by-step tips for raising more money without lots of resources. Click here for more information or to get your copy.